If you or your loved ones have been injured in a collision or accident involving a cement truck and need immediate assistance, the Law Offices of David Azizi are standing by 24/7 to take your call, answer your important questions, and provide a free cement truck accident case review during this difficult time. We put your safety first and know that pursuing legal action against truckers and the large corporations they work for can be very difficult. Our goal is to support your physical recovery while we fight the justice and financial compensation you and your family deserve. Call us at 800-991-5292 or chat with us now. A cement truck, more commonly called a concrete truck by the construction industry, is a commercial vehicle that transports large quantities of cement, water, and construction mixing materials like sand and gravel — called aggregate — all used to produce the finished product of concrete. A cement truck normally transports the concrete in a cylinder-shaped drum made of steel or fiberglass that gets attached to the cab of the truck. What Makes Cement Trucks Dangerous? A cement truck cab (where the driver sits) and trailer can weigh up to 30,000 pounds and is capable of carrying a cargo of an additional 40,000 pounds of concrete materials. When 70,000 pounds of steel, gasoline, concrete and fiberglass spill their contents or collide with another vehicle carrying passengers, traumatic injuries are nearly always involved. It’s important to know the legal steps to take after an accident with a concrete truck. In this audio podcast, cement truck accident lawyer David Azizi answers the most essential questions about crashes with big rigs, 18-wheelers, buses and other large trucks and commercial vehicles. Play the episode below. Drivers of concrete trucks and the companies that contract these drivers are legally held to a higher standard than regular passenger vehicles. The drivers of large commercial vehicles must obtain additional training, must be issued a Commercial Driver’s License (CDL), and different California laws apply on the roads and in the warehouses. Cement truck drivers must, for example, abide by different laws regarding the use of alcohol and drug use. The typical “one drink per hour” trend followed by some passenger vehicle drivers to keep their blood alcohol concentration (BAC) below 0.08% does not work the same for commercial drivers, who are legally bound in California to maintain a BAC below 0.04%. When they do not meet this standard, these truckers have violated California DUI laws. These higher standards apply across many disciplines of the industry, meaning that truckers and the big truck companies must follow the same set of laws passenger drivers follow, plus several additional laws specific to trucking industry. Violate any of these, and they are liable for the wrecks and injuries caused when operating large concrete trucks. Liability, in its most basic form, means that you are the party or parties responsible, or “at fault,” by law for the wrong that has been done to another person, and that those wrongs carry consequences requiring action. If a trucker has committed a criminal act, they may face criminal penalties including jail time. If they have caused you or your property harm, a civil law case will usually determine how they need to pay for their errors. The most common way a cement truck or semi truck accident lawyer will work to establish the liability of the driver and the trucking company is by proving negligence. Negligence means the driver owed you that high duty of care on the road, and did not meet those standards, and you got harmed as a result. A skilled and experienced cement truck wreck lawyer will know how to establish liability. Once we determine the trucker and company are at fault, then we can pursue a recovery for you in the form of money damages — the financial compensation required to “right the wrong” and bring justice to the injured victims and their families. How Much Is My Cement Truck Accident Claim Worth? Liability – who is at fault? And what percentage are they at fault? Damages – what financial penalties exist? What are your specific injuries? How much will your total expenses be not just today, but five or 10 years from now as a result of this accident? We encourage a visit to our truck injury settlement calculator to get a first guess as what your case might be worth. Armed with this preliminary information, you can have access to similar tools that we will use during a free review of your case. Please note: the best way to determine the accuracy of what your case will be worth is through our free case evaluation process where we dig deep into the evidence and facts of your specific case. 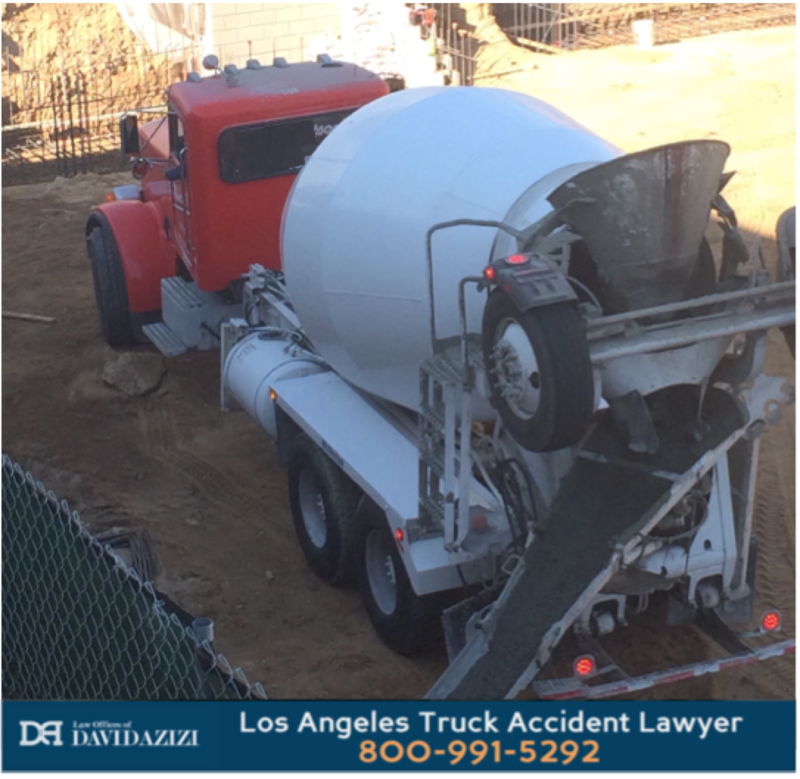 Begin With a Proven Cement Truck Accident Law Firm in L.A. The Law Offices of David Azizi are committed to fighting for your justice, taking on the big trucking companies, and making sure that every cement truck driver is made to pay what they owe for their negligence in a major concrete truck wreck. We know the words “do not delay” are very common in many industries. In Civil law, which handles these cases, there is a deadline for beginning a legal claim or lawsuit. For a case involving a government vehicle, the statute of limitations in California can be as little as six month. We encourage every injured victim to protect themselves by taking the next step for a free case review before that critical window closes. Cement truck cases can be very complex and you can bet the trucking companies have huge legal and financial resources fighting to make sure you don’t get paid fairly. David and team have a 98 percent success rate with personal injury cases are standing by for your call 24/7, or you can reach them via the form or chat function on this page. It’s time to get the justice and financial recovery you and your family deserve by law.